Over the course of her twenty-seven-year career as a legal professional—including her earlier work in private firms and her latest in-house counsel position at Nationwide, where she has been for the past eleven years and where she currently oversees corporate, IP, financial services, litigation, and discovery management—she has championed these beliefs through involvement with a broad roster of outside associations, through internal diversity efforts, and through mentorships and sponsorships. The work is something she sees as a calling. 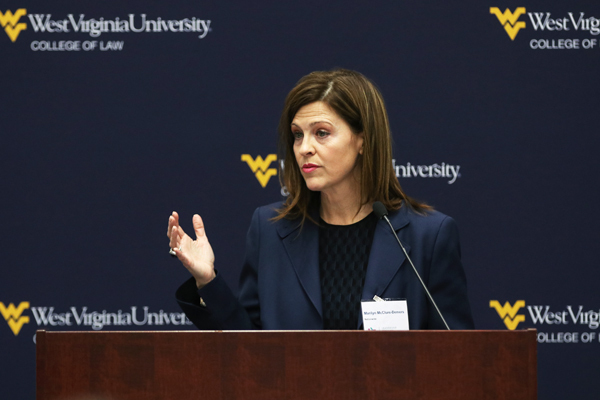 It all began early in her career, after she earned her JD from West Virginia University and began doing legal work in the coal industry. There, she often encountered many challenges as a young female lawyer, and in her later work at firms and businesses in Illinois, Pennsylvania, Ohio, and elsewhere, she overcame perceptions associated with being a native of West Virginia, a region that has often been stereotyped. 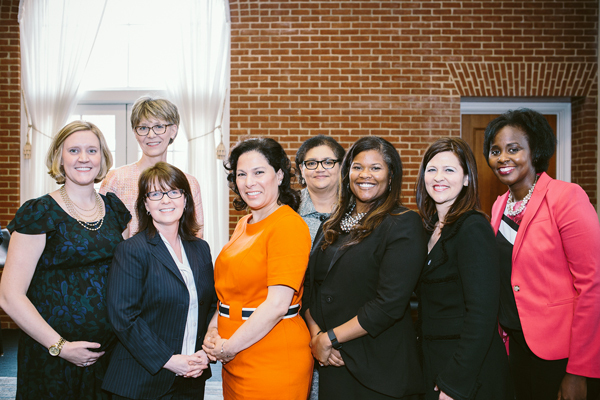 Marilyn McClure-Demers (second from right) poses with judges and lawyers of the Ohio Women’s Bar. Her push for diversity occurs in three different areas: in her practice with her clients and her technical work, in her stewardship as a leader and influencer in the profession, and in the culture of her organization and the culture at large. Some of her largest initiatives have come through her work with the Leadership Council for Legal Diversity (LCLD), which Nationwide joined and McClure-Demers was selected as one of the first fellows for, before she later joined the executive council. In addition to bringing Nationwide to the organization as a member, she also spearheaded an effort to bring the council to her alma mater to create conscious strategies with the state bar leadership, law school, and private practitioners. She has also worked to improve the inclusivity and diversity of the membership, program offerings, and boards of the Ohio Women’s Bar, and she has partnered with organizations such as the National Bar Association, the Minority Corporate Counsel Association, Corporate Counsel Women of Color, the Hispanic National Bar Association, the National Asian Pacific American Bar Association, and Lavender Law. Additionally, McClure-Demers helps Nationwide participate in minority clerkship programs, and she has played a role in a range of events focused on creating safe environments for candid conversations, particularly around issues such as unconscious bias. “In leadership, we need appreciation for the importance of this,” McClure-Demers says. Her external partners have taken notice of her commitment to diversity, too. “Marilyn’s commitment to diversity is evident in everything she undertakes, from her leadership in the LCLD and related organizations to her approach to her work at Nationwide and the way she lives her life,” says Aneca E. Lasley, a partner at Squire Patton Boggs. And, she says, this positions her team and the people on it to best serve the needs of their organization. “Regardless of the legal need, we’ve come up with a cost-effective, outcome-positive result more quickly and efficiently with diverse teams,” McClure-Demers says. Challenges stemming from unconscious bias remain, though, so McClure-Demers has also relied on metrics to help communicate the value and necessity of diversity to leadership, using data from a McKinsey study and other sources. “Metrics have played an important part in disrupting people’s unconscious bias, where we see that we’re not where we need to be,” McClure-Demers says. She is also a major proponent of mentorship and sponsorship, and she feels she learns about as much from her mentees’ perspectives as they learn from her. She particularly enjoys playing the role of connector, so much so that she founded a chapter of the Women’s Leadership Network in Delaware County, Ohio; it brings professionals together for community-service initiatives. As McClure-Demers works to push conversations about diversity and inclusion more into the spotlight, she also makes sure she is always learning from others. Her hope is that, as conversations grow around key issues such as race, ethnicity, and gender, organizations will gain more diversity of perspective, more diversity of geography, and, thus, more diversity of thought. Members of the Squire Patton Boggs insurance/reinsurance dispute-resolution team have decades of experience representing insurers, reinsurers, and captives in coverage disputes involving a wide range of claims and coverages. The team’s litigators have been and continue to be involved in some of the largest life insurance and reinsurance disputes involving members of the industry. Squire Patton Boggs represents insurers in connection with the full range of underlying claims, including some of the highest-profile losses such as those stemming from benzene, molestation, sports concussions, silica, asbestos, medical implants, PCBs, MTBE, PFOAs, pesticides, pharmaceuticals, wildfires, hurricanes, and other natural disasters. The firm has litigated and/or arbitrated coverage disputes involving professional liability, life and health, variable annuity, general liability, surety, product liability, employment discrimination, and environmental matters. Its lawyers are recognized in Chambers USA and Chambers Global 2018 for Insurance Dispute Resolution, Insurance Coverage Litigation, and Reinsurance Arbitrations. Squire Patton Boggs provides insight at the point where law, business, and government meet. With more than 1,500 lawyers across forty-seven offices in twenty countries, it delivers commercially focused legal services and invaluable connections on the ground to a diverse mix of clients across the globe.